Good morning! How can I help you? Would you like something sweet or rather a wholesome treat? And how about some fresh fruit and crunchy vegetables? 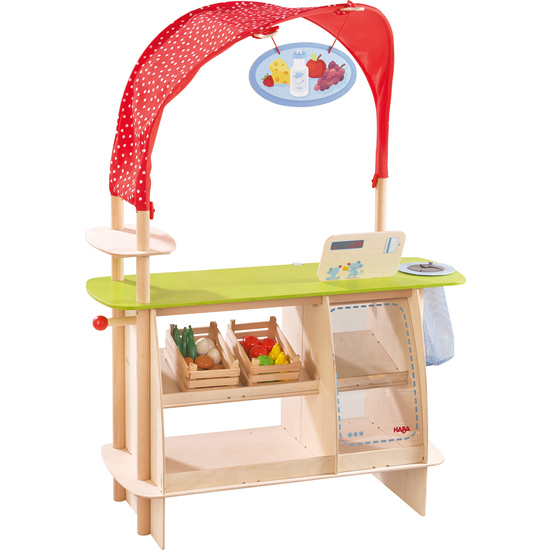 The HABA play store Shopping Bliss includes an integrated fresh foods counter, offering young customers all the best foods. The display can be varied with the most diverse play store articles, according to the shopkeeper’s pleasure. Contents: 1 mountable wooden scanner register, 1 paper bag dispenser, 2 wooden crates (with 22 pieces), 1 detachable recycling net bag for returnable bottles, 1 hook and loop attachable textile register drawer including notebook.